WHAT NO ONE TELLS YOU WHEN STARTING A SIDE HUSTLE..
What's the definition of a side hustle? Let's start with what is a side hustle. A side hustle is any type of employment in addition to one's full time job that a person is passionate about. According to a Bankrate.com report 4 in 10 Americans have a side hustle and more than 50% of millennials have a side hustle. 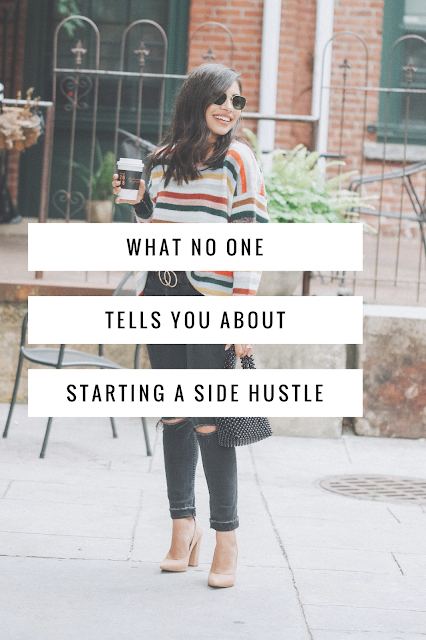 There are many different reasons a person has a side hustle. For me it is to attain a dream. I moved from Rochester, NY to Providence, Rhode Island 8 years ago and needed a creative outlet. I acquired a state job while living in our new state but everyday I felt unfulfilled professionally and creatively. The only thing I would have to look forward to was to write for my blog, record tutorials for youtube and shoot fashion content with my then fiance on the weekends. My blog (AlanaMarieStyle at the time), filled my creative tank. I would feel a great sense of pride when it was time to push out new content and I would immerse myself into researching new ways to make my blog look better. Recently I've taken more chances in my blog writing and sharing intimate posts with my readers. When I was younger english was one of my favorite subjects. My elementary school had a very small library and I wouldn't want to leave. I have always had a love for books and writing. I told myself that even if just one person reads it, the process feels so good and therapeutic to put my thoughts and feelings into a post. This year is the first time in 8 years that I am working on my blog full time. I have side hustled for so long and have failed, struggled and learned many lessons throughout my journey. But don't feel alone because on the bright side we are in good company. So many start up companies started with a dream that consisted of long weekday hours after work, working all weekend and failing (hello Steve Jobs for example!). Ask yourself why do I want to do this? Is it to make extra money? Is it your passion? 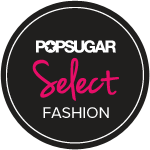 Do you want to pursue this dream full time? How do you want to service others? Figure these questions out and create your mission statement and vision. Having a clear vision will help you plan out how to approach things tactically. This is something that I honestly didn't prepare myself for when I first started my blog. I naively thought that after a short amount of time I would be attending lavish NYFW shows and running a media company in a Pinterest worthy office. What no one prepared me for was the long hours and many years of feeling stuck and working hard on researching and teaching myself tech, web hosting, marketing, strategizing and so many other areas that are necessary to grow your side hustle or business. Be patient and realistic on how long it will take to get from point A to point Z. Expect rejections and failures along the way and countless hours feeling like it won't pay off. But remember it will! Appreciate the journey! Whether you are pursuing a side hustle while still maintaining a full time job or pursuing your business full time, sacrifices have to be made. For so many years all of my weekends with my husband were spent shooting looks, writing content and strategizing my content calendar. Time for yourself, going out with friends and your family will take a hit. You will feel guilt and probably isolate yourself without even realizing it. However learn it from me burn out will not help you or your business. Yes make sacrifices but try to find a happy balance in the chaos. Create a schedule and boundaries for yourself. I love to have planners and calendars and add in your day time to eat lunch, take a break, call your friend or family member. These little things will help you provide much needed healthy balance in your day to day hustle. There is so much information out there on the web on how and where you should start investing your money into your business. All this information is great but do what works for you. Research things that are going to give you a return on your investment. Task: Write down the things that are not getting down. Is it sending out newsletters? Is it updating your website? Getting those blog posts out? Advertising? Once you write all these things down you can see where things are falling through the cracks and narrow down the kind of help or product service(s) that you need. Also ask others. Don't be afraid to ask other business owners, bloggers, friends, family or social media connects for advice and/or suggestions. Do you envision this side hustle into something bigger one day? What is all this hard work and hustling working towards? It can be very scary to switch careers. But big dreams are naturally scary. If you have big dreams for your side hustle you should have a clear plan on how to get there. Tip: Figure out how much you have to make from your side hustle in order to make it full time. Write down all your monthly bills and how much you have to make monthly to avoid debt and set backs. While your working your full time job use that money to invest in your business. It is also a good idea to save money while your working a full time job. This extra money can help you in the beginning of your full time journey to invest in areas needed or provide a cushion to pay your bills and avoid stress and anxiety. I could go on and on but I feel these 6 main tips are a great start on helping you guys get the right mind frame on starting your side hustle. Instagram can glamorize things but I want to be transparent and give you guys the real real! I have almost quit so so so many times on this dream but I am always reminded that I have come so far so why stop now! Plus my dad would kill me because he always taught us to never quit! Thank you babes for your support and I look forward to this journey with you guys! God bless! These are great tips, Alana. Thank you for being honest and sharing your experiences. Thank you for taking the time to read and leave a comment! if you have any topic ideas please let me know! I wish someone had told me this! I too thought this was going to be easy! Definitely not lol but for the most part, I've enjoyed it. Thanks for sharing your tips! Hey hun! thank you for taking the time to read! I really appreciate it! I hope to share more tips this year to hopefully help others save time and not make the same mistakes I made!